Seven Against Thebes captured first prize for its playwright in its premier performance at the 467 BC Athenian drama festival. A veteran soldier who lost a brother in combat, Aeschylus vividly evokes the tangible terror, the scent of slaughter and the complete rout of the body and spirit that are the awful spoils of war. From the heart of the battle to the heart of the city, the cost of bloodshed is devastating and inescapable. Few plays have captured the delirium of war as precisely and poignantly as does Seven Against Thebes. Meagher's translation was commissioned by acclaimed actress Irene Papas and features notes on the text. This edition is an affordable presentation for the general reader, the college student, the director and performer alike. Meagher's very stagable translations of ancient Greek drama have won critical acclaim from actors, directors and scholars. ABOUT THE AUTHOR Robert Emmet Meagher has won critical acclaim from actors, directors and scholars who have commissioned, read, and performed his translations of ancient Greek plays in the United States, Great Britain, and Ireland. His unmatched skill in eliciting the power and passion of Greek drama is a synthesis of innate dramatic sensibilities, academic brilliance, and an interdisciplinary approach. Since completing his doctoral studies at the University of Chicago, Meagher has taught literature, drama, epic, comparative religion, theology and philosophy as a visiting professor, a guest lecturer, and a full-time professor. Actress Irene Papas, who has commissioned three translations from him, praises Meagher's "true sense of dramatic construction . . . his dialogue is always sharp, frequently daring, and invariably extremely actable." The late Michael Joyce of Dublin's Samuel Beckett Center and the Royal National Theatre of Great Britain called him "the finest living translator of ancient Greek Drama." Other books include: Euripides' Helen, Mortal Vision: The Wisdom of Euripides, Euripides' Iphigenia at Aulis & Iphigenia in Tauris, Helen: A Study in Myth and Misogyny, Euripides' Bakkhai, Euripides' Hekabe, and Aeschylus' Seven Against Thebes. FROM THE AUTHOR In the Seven, the scent of war is fresh, its terror tangible. Indeed, the memory of war clings pitilessly to those who have been cursed to experience it first-hand. This play leaves no doubt that Aeschylus knew with painful intimacy what he was writing about. The more archaic elements in the play's structure - the father's curse, the relentlessly avenging Fury, the divine lot assigning brother to brother - ought not to distance anyone from this work. Curse, fury, and fratricide are as familiar today as ever before. They are the "active ingredients" and certain "side-effects" of war, whether it be waged in Thebes or Saigon, Bosnia or Lebanon. Few plays have ever captured the delirium of war as precisely and poignantly as does Seven Against Thebes. From Meagher's Notes on the Text. 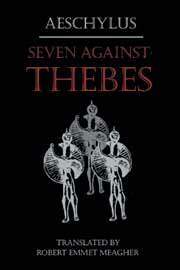 FROM THE PUBLISHER Few plays have captured the delirium of war as precisely and poignantly as does Seven Against Thebes. Meagher's translation was commissioned by acclaimed actress Irene Papas and features: - Notes on the Text - Affordable presentation for the general reader, the college student, the director and performer alike.